This is the second half of my 10NL review video for the PokerTrikz member Brizzle. You should watch the first half at Trikkur 53 – Brizzle 10NL Review 1 because this picks up where that ended. 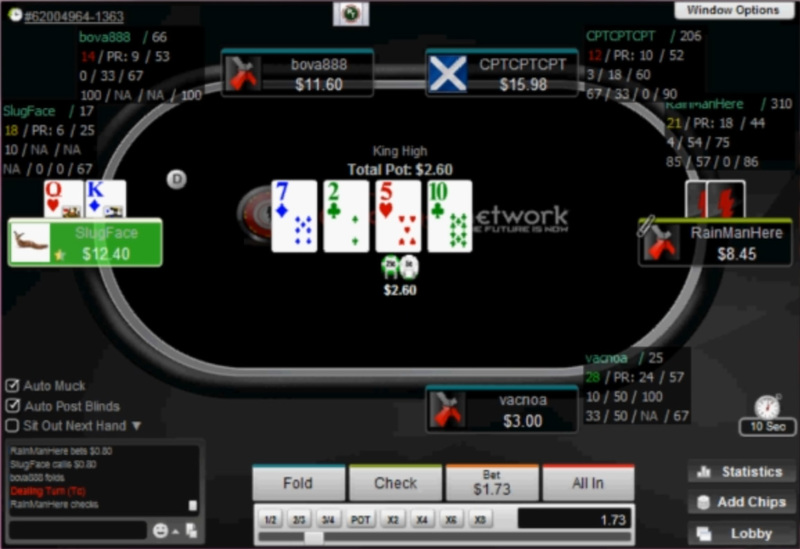 In this part of the review, I stress some of the key points from the first video such as playing a tighter range and betting large with your strong hands. I also go into details about good spots that you can play aggressively at the micro stakes. I want players to start looking for spots that they can raise to take the lead in the hand instead of just calling and playing passively. The main focus of this video was to get players looking for spots they can play aggressively instead of passively. I classify actions such as checking and calling as passive; where betting and raising is aggressive. There are many reasons that playing aggressively is better than passively, but the most important is the ability to force your opponent to make a decision to continue on with the hand or not. Making your opponents fold can be just as profitable as having the best hand at showdown (especially if you didn’t have the best hand at the time). Playing in this aggressive manner with non-made hands also allows you to play your large made hands fast and aggressive as well. Building large pots when you have the best hand was one of the key skills I talked about in the last review video. Playing aggressive with non-made hands usually means you will be making bluffs. I try to avoid teaching micro stakes players to bluff because they end up doing it way too much and usually in the wrong situations. However, a well planned bluff can turn a hand with no chance of being the best at showdown into a profitable, winning hand. There are two ways that I generally classify bluffs – Pure Bluffs and Semi-Bluffs. A pure bluff is when you make a bluff without having any outs to improve your hand if/when you’re called. That doesn’t necessarily explain the concept the best though because it is impossible for us to know if you will have outs when called until it is too late. As in, by the time you find out that we are drawing dead and your bluff was a “pure bluff” would be after our opponent makes the call and you are crushed. This is why you need to consider your opponent’s range of hands when deciding to make a bluff. If you are not careful when making a pure bluff, you will end up in the worst possible scenario; your bluff raise forces the opponent to fold with every hand that is worse than yours, but call with every hand that is better. I considered Brizzle’s float with KQ at the 12-minute mark a pure bluff. The opponent’s range of hands that would call this bet would dominate our KQ. Once your opponent calls, what cards could KQ catch on the river to improve? Even the 3x Kings and 3x Queens may very well be tainted because an UTG raiser rarely plays something like KT, KJ, QT, or QJ; but will frequently have AK, AQ, and KQ in their range. That doesn’t mean I disagree with this turn bet though. After making the calls preflop and on the flop; I feel that a bet on this turn is actually a necessity. If we check behind the turn and the river checks through, I can’t think of any hands that we beat at showdown. We will lose to any small pair and even his Ace high hands that make up a fairly large percentage of his range. This is a decent spot to bluff because you have a good chance of folding out better hands. Making a bluff when you a number of outs if called is considered a semi-bluff. This is by far my preferred method of making bluffs and a very easy spot to turn your passive play into aggressive play. Think about situations that you are calling a continuation bet with a draw and the chances that you would be willing to also call a turn bet. If you are going to call a flop + turn bet anyway, you might as well make a raise on the flop. It will be for the same amount of money that the flop + turn call would cost, but it gives you a chance to instantly win the pot. Taking the lead in the hand also gives you a good chance to check back on the turn and take a free river card. I think the TJ hand that was going on the same time as the KQ hand, would have been a great opportunity to make a semi-bluff raise on the flop. You have 8 real outs to the straight and 9 potential “bluff outs” to the flush. This video was made on the PIV Game Network, but they are unavailable to US players. 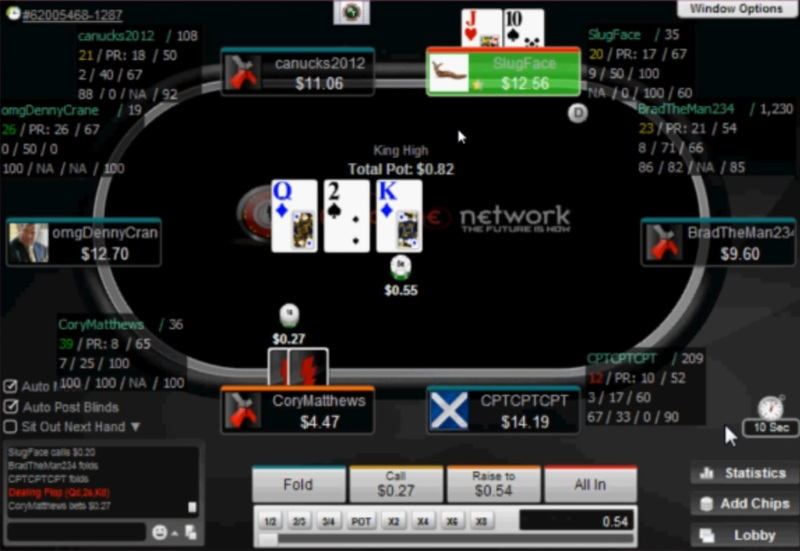 Instead I would recommend playing at Carbon Poker, which is on the Merge network. They are one of the most respected poker rooms in the world and have the best options for US players to deposit and cash out. If you are looking for a well respected and safe place to play, then look no further than Carbon Poker. Players that sign up through PokerTrikz will receive 35% rakeback and entrance to exclusive freerolls and rake races every month. You can sign up or find more information on our Carbon Poker rakeback page.